A Union Pacific Railroad train derailed south of Elk Grove early this afternoon. 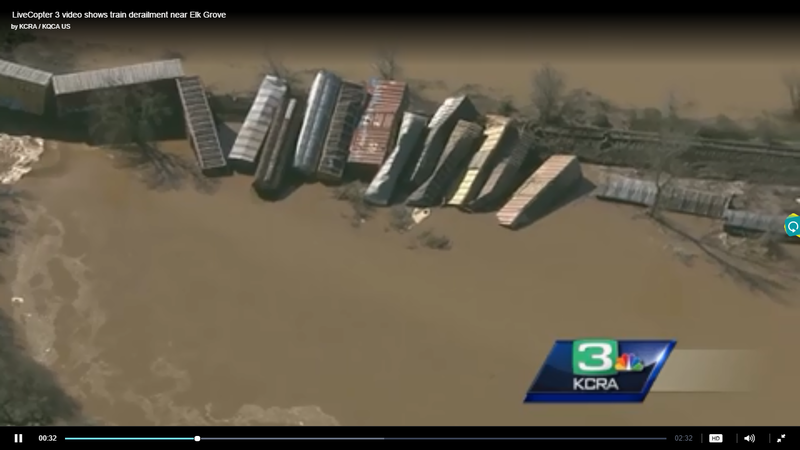 According to video feeds from KCRA, 17 cars derailed on a portion of the track crossing the Cosumnes River flood plain just west of State Highway 99 near Dillard Road. In the last several days, that area has been subjected to road flooding following heavy rains. There were three people on the train crew and there are no reported injuries. There are no immediate reports of hazardous spills form the Cosumnes Fire Department which is currently on the scene. The derailment is causing heavy traffic on southbound 99 between Elk Grove Boulevard in Elk Grove and Twin Cities Road in Galt. Motorist are advised to avoid the area. KCRA's aerial video can be viewed here.